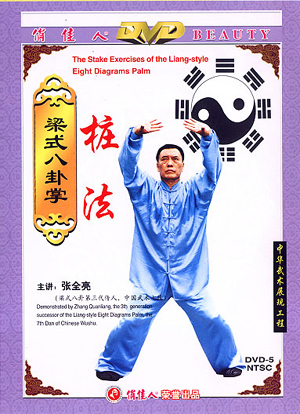 Like the Walking-in-circle Exercise, the Stake Exercises are also essential techniques for beginners as well as for advanced boxers in Eight Diagrams Palm. So the exercises should be done throughout one's practicing life. The Stake Exercises can be divided into three parts, that is, the elementary, intermediate and advanced. Thought having their own unique features, they are linked with each other as a system. The first part is the Fixed Eight Stakes; the second is the Linked Eight Stakes, the third is the Spirit and Form Eight Stakes.